This tent-shaped reliquary now preserved at Boher Catholic Church contains bones from St Manchan, the 7th century founder of a monastery at Lemanaghan. The Shrine is a gabled box of gilded yew wood with bronze and brass metalwork and enameled fittings. It was made c.1130 at Clonmacnoise and is approximately 5 times larger than most shrines. 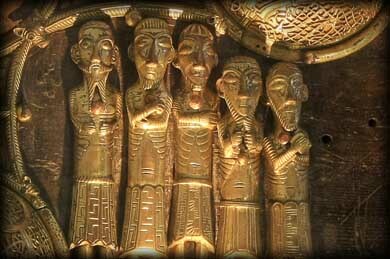 It was originally decorated with about 50 to 52 full length human figures, possibly modeled on a cross between the Hiberno-Norse and the Romanesque styles. Only 11 of those figures now remain. The two remaining figures on the far right are tongue-stickers and one of them is also a beard puller. Controversy surrounds the symbolism of the figures - one source suggests they represent warriors with axes and sticks, while a recent paper identified the figure holding an axe as depicting Saint Olaf of Norway. 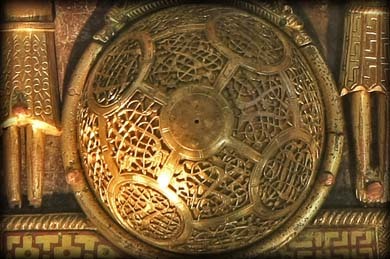 The brass rings at the bottom corners of the shrine illustrates that it was designed to be carried on poles. For over 800 years the shrine was used for public oaths and many people believed it had the power to cure illnesses. The shrine was kept at Lemanaghan until the 18th Century when the medieval church fell into ruin. It was moved to a thatched barn church at Cooldorrough until 1860 when it was moved to Boher church, closer to the monastery which the Saint founded. 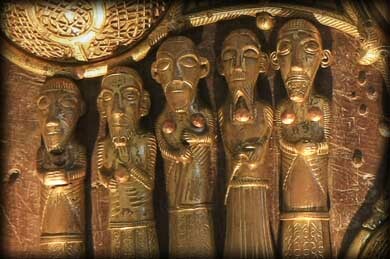 This shrine is the largest and most magnificent ancient reliquary in Ireland. The intricacy of the metal work is amazing and we were in awe of the workmanship involved in creating this masterpiece of Irish Christian art. Situated; The shrine was kept on display at the catholic church in Boher, County Offaly. In 2012 the shrine was stolen from the church, but recovered the following day. It may not be back on display in the church, please enquire before visiting. Discovery Map 48: N 182 305. Last visit March 2011.